A fast paced Mafia tale of kidnapping, murder, love and betrayal. While investigating the Nancy Miller case, Boston Detective Tony Capella had fallen for the petite blonde now sleeping beside him. He wasn’t sure if he believed in love at first sight, even so, their transcontinental flight was speeding them towards their wedding. What Tony didn’t know was that the troubles they thought they’d left behind, in America, were not. Join Tony, Deirdre and Courtney in a tale of kidnapping, murder, love and betrayal. A journey that leads them from Venice to southern Italy, where lying in wait is the beautiful and utterly ruthless, Adelina Vittorio, the Daughter of the Don. I’m a long time fan of Ian Fleming’s James Bond books. They’re fast paced and packed with action, intrigue, romance and the ruthless villain. I believe that characters should be multifaceted and human. 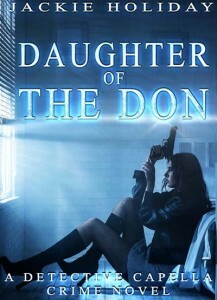 Daughter of the Don is a real “girl power” book with strong women protagonists. I had planned for our male lead to rescue the “damsel in distress” and just couldn’t bring myself to do it. “No” I thought, “She has to save herself.” This holds true throughout Daughter of the Don. She turned to the passenger seat, still smiling. Anette returned her smile. Adelina had chosen her group with care. San Marco dei Cavote was well known for its cliffs and general inaccessibility. She had picked only those who could climb and who were light and quick, a real “ninja team”, who were, consequently, all women: Anette, Elisabetta, Luciana and Rosaria. Each of whom had proven themselves by: assassination with knife or poison, the theft of a string of diamonds, inserting bogus documents at city hall and, most importantly, being able to last five minutes fighting Adelina hand to hand. Adelina had no sisters, but if she had, these would be the ones she would have chosen. She knew these women. She had done jobs with them, gone to clubs and drank with them and she had heard their stories. Stories of their conquests, of the men they had loved, had fought over and had killed for. They were daughters of Capa’s, or kitchen workers, it didn’t matter, everyone, when called upon, worked and fought for the family. They were the tip of the spear. Their job: to infiltrate the smuggler’s mountainous defenses and to clear the way for the Vittorio “heavy troops”, who stood by at the base of the mountain, concealed, awaiting Adelina’s signal. Night had fallen. Adelina donned a pair of infrared night-vision goggles and the rough terrain changed from grey to green.